Here is a free knit pattern that might interest knitters who are opinionated, feisty, and scrappy. Based on my personal observations that would be all of them. Its a hat, just a plain ol’ hat, with secret in-your-face! messages stitched into them. The idea? Use slip stitch colorwork to add Morse code to my knitting. The hat is mostly made in rounds, of course. The colorwork is done in short rows using a contrast color. Each short row spells out one word. Meet joe. Joe is usually taking pictures for me but this time he got to be in one. This one says “believe you can”. This one says “prove them wrong”. 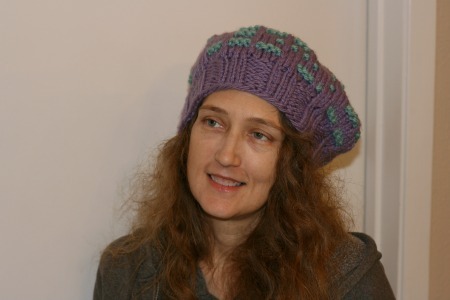 Once you’ve made one of these hats, or even just read through the pattern, you can come up with your own in-your-face! message to stitch in. Here is a link to the Morse Code Translator that I used to turn words into dashes and dots. 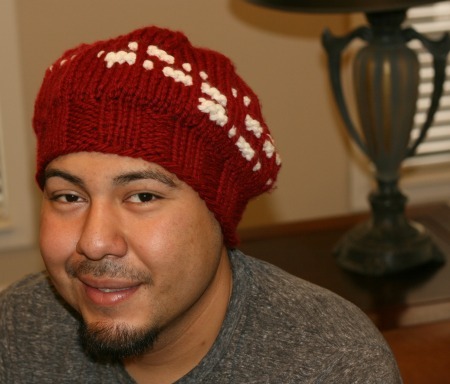 The yarn: I used Bernat Softee Chunky in two colors. The needles: Use a US size 10 (6mm) for the brim and a US size 11 (8mm) for the body. Cast On 50 stitches. Join to work in the round. Switch to US size 11 needles. Join in Contrast Color (but do not cut Main Color). Row 12a: k1, slyb1, k3, slyb3, k3, slyb1, k1, slyb3, k1, slyb1, k3, slyb1, k1, slyb1, k3 Stop. Do not finish the round. Turn the work so as to look at the Wrong Side. Row 12b: All the stitches in contrast color… knit those. All the stitches in the main color… slip those with yarn held to the front until you are back at the beginning of round. Leave the Contrast Color strand hanging on the Wrong Side. Row 16a: k3, slyb1, k1, slyb1, k1, slyb3, k3, slyb1, k3, slyb1, k3, slyb3, k3, slyb1, k3, slyb1, k1, slyb1, k3 Stop. Do not finish the round. Turn the work so as to look at the Wrong Side. Row 20a: k1, slyb3, k3, slyb1, k1, slyb1, k1, slyb1, k1, slyb3, k1, slyb3, k1, slyb1, k1, slyb3, k1, slyb1, k1, slyb1, k3, slyb1, k1, slyb3, k1, slyb3, k1, slyb1, k1, slyb1, k1 Stop. Do not finish the round. Turn the work so as to look at the Wrong Side. Row k1, slyb1, k3, slyb1, k3, slyb3, k1, slyb1, k3, slyb3, k3, slyb1, k3, slyb1, k3, slyb3, k1, slyb1, k3, slyb1, k1, slyb3, k3, slyb1, k3, slyb1, k1 Stop. Do not finish the round. Turn the work so as to look at the Wrong Side. Row 16a:k3, slyb1, k3, slyb3, k1, slyb3, k1, slyb1, k1, slyb1, k1, slyb1, k1 ,slyb3, k3 Stop. Do not finish the round. Turn the work so as to look at the Wrong Side. Row 20a: k1, slyb3, k3, slyb1, k1, slyb1, k1, slyb1, k1, slyb3, k3, slyb1, k3, slyb1, k3, slyb3, k1, slyb1, k3, slyb1, k1, slyb3, k1, slyb1, k3, slyb1, k3, slyb1, k1 Stop. Do not finish the round. Turn the work so as to look at the Wrong Side. Cut yarn and use a tapestry needle to pull the end through all remaining stitches. Weave in and enjoy your secret message hat! 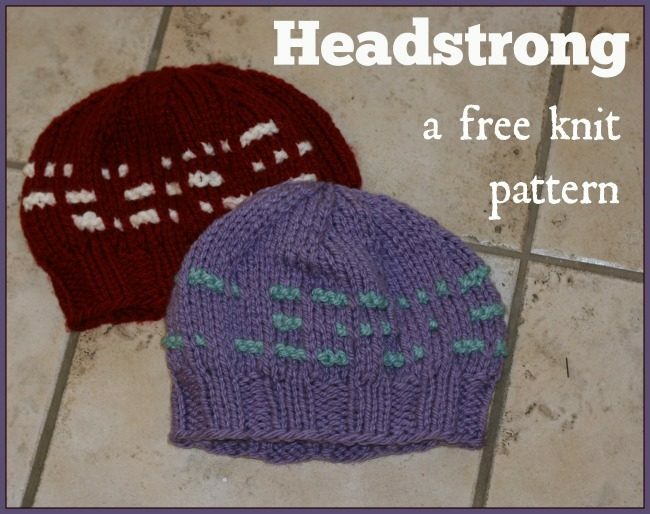 12 Comments on "Headstrong – a free knit pattern"
Sure hope the antihistamines worked for their intended purpose as well as they did for your creative imagination! This hat will be fun to make and wear. Thank you. They did give me some much needed relief. But then I had a benedryl hangover the next day. Those pills sure do mess with me big time. This is very cool! Thinking about how to translate it into crochet… Thanks for sharing! Most welcome! If you come up with a crochet version, please let me know so I can include a link. lol I’m glad to have earned a spot in your gmail. And I hope this hat keeps you warm when your winter hits. I also hope it puts a secret smile on your lips. Oh, my! I adore these! And thank you for the Morse Code translator. I feel the need for some hats with saucy code!